Left ventricular assist devices (LVADs) are common and implantation carries risk of AKI. LVADs are used as a bridge to heart transplantation or as destination therapy. Patients with refractory heart failure that develop chronic cardiorenal syndrome and CKD often improve after LVAD placement. Nevertheless, reversibility of CKD is hard to predict. After LVAD placement, significant GFR increases may be followed by a late return to near baseline GFR levels, and in some patients, a decline in GFR. In this review, we discuss changes in GFR after LVAD placement, the incidence of AKI and associated mortality after LVAD placement, the management of AKI requiring RRT, and lastly, we review salient features about cardiorenal syndrome learned from the LVAD experience. In light of the growing number of patients using LVADs as a destination therapy, it is important to understand the effect of these devices on the kidney. Additional research and long-term data are required to better understand the relationship between the LVAD and the kidney. Five and a half million Americans suffer from congestive heart failure (CHF) (1) and many have CKD. The pathogenesis of CKD in patients with CHF is multifactorial (2). In patients with advanced CHF refractory to medical therapy, implantable left ventricular assist devices (LVADs) improve survival and quality of life (3). LVADs are used as a bridge to transplantation or as destination therapy in patients ineligible for heart transplant. Kidney function often improves after LVAD, but hemodynamic instability and right ventricular failure postoperatively may cause AKI. Early postimplant gains in GFR may be followed by a gradual decline in GFR with long-term LVAD support (4). It is paramount for nephrologists to become familiar with managing these patients. Here, we will review (1) early and long-term changes in GFR after LVAD implantation, (2) the incidence and outcomes of AKI immediately after LVAD implantation, (3) the lessons learned about cardiorenal syndrome from the LVAD experience, and (4) the management of AKI requiring RRT. The typical configuration of all LVADs includes the implantable pump, an externalized power cord (i.e., driveline), and a power source (i.e., batteries), as shown in Figure 1. Although the first-generation LVADs (HeartMate XVE) improved 1-year survival compared with medical therapy alone (52% versus 25%; P<0.05) in patients who are ineligible for heart transplant, they suffered from mechanical and infectious complications (3). LVADs in current use include the HeartMate II left ventricular assist system (Abbott, Inc., Pleasanton, CA), an axial flow pump, and the HeartWare HVAD (Medtronic, Inc., Framingham, MA), a magnetically levitated, centrifugal flow pump, both of which are continuous flow, or “nonpulsatile” by design. Patients are treated with antiplatelet and anticoagulant medications, typically a combination of aspirin and warfarin, to reduce the risk of clot formation within the device and of embolic events through the device, such as stroke (1,2,5–7). LVADs drain blood from the left ventricular apex through an inflow cannula, passing through the pump machinery, and returning to the arterial system via a graft to the ascending aorta (Figure 1). It is powered by a driveline that exits along the lateral abdominal wall and is connected to a battery-driven controller. The mechanical shear stress on red blood cells as they move through the pump causes continuous low-level hemolysis, which is monitored by following serum lactate dehydrogenase levels. In addition, there is a well documented breakdown of the large vWf multimer leading to acquired von Willebrand disease, which has been associated with arteriovenous malformations in mucous membranes that can lead to severe epistaxis and gastrointestinal bleeding (7). Components of the HeartMate II. (A) HeartMate II LVAD. The device has four components: implantable pump, driveline, external power source (e.g., batteries), and a system controller. Blood travels from the apex of the left ventricle through the inflow cannula, into the pump, and out via a graft that is attached to the ascending aorta and to the systemic circulation effectively bypassing the aortic valve. The system controller has a display screen that shows key device parameters. Power must always be supplied by two sources, either both batteries or via the power module, which is used in the home during sleeping hours. (B) A closeup of the HeartMate II system controller. Patients or caregivers can scroll through the different parameters (speed, flow, power, and pulsatility index) by pushing a button on the controller. One can also determine the amount of charge left in the batteries to avoid running too low. Images provided courtesy of St. Jude Medical, Inc. LVAD, left ventricular assist device. The HeartMate 3 is under clinical investigation and is also a magnetically levitated, centrifugal flow pump, but engineered to create “pulsatility” by programmed speed changes (6). Initial analysis at 6 months postimplant revealed no episodes of pump thrombosis in the HeartMate 3 group (centrifugal flow) compared with 10.1% in the HeartMate II (axial flow) group, but with no difference in mortality or disabling stroke (6). Although kidney function improves after LVAD implantation, the incidence of early AKI ranges from 15% to 45% (Table 1). Incidence of AKI does not differ between patients implanted with pulsatile or continuous flow pumps (8). Table 1 shows that the reported incidence of AKI has not changed over the years. AKI is associated with high mortality, and the need for RRT ranges from 6% to 32% and is also associated with increased mortality. Early AKI may result from hemodynamic instability. Table 2 highlights predictors of AKI. Topkara et al. (9) showed that patients with postoperative kidney failure requiring dialysis were older (mean age of 53 years), had a higher incidence of intra-aortic balloon pump (IABP) use (47% versus 26%), a higher preoperative mean LVAD score, and lower mean total protein (5.8 g/dl versus 6.4 g/dl) and albumin levels (1.2 g/dl versus 3.3 g/dl). This particular LVAD score includes (1) postimplantation shock, (2) ventilatory status, (3) central venous pressure >16 mm Hg, and (4) prothrombin time >16 seconds (9). Right ventricular failure plays a large role in postoperative AKI. Right ventricular failure contributes to decreased renal arterial blood flow, urine volume, and deterioration in GFR (10). Pre- and postimplantation prevention of AKI is synonymous with prevention and/or management of right ventricular failure, if LVAD parameters and BP have been optimized. Strategies include maintaining coronary perfusion pressure (e.g., relatively high mean arterial pressure (MAP) and relatively low central venous pressure), reducing wall tension with IABP, diuresis, and maintaining right ventricular cardiac output via inotropes. A MAP target of 70–80 mm Hg and central venous pressures of 8–12 mm Hg are recommended. Diuresis or ultrafiltration may be necessary to achieve these goals. In cases of severe right ventricular failure, placement of a temporary right ventricular assist device may improve kidney function. By decreasing right-sided filling pressure and increasing cardiac output, adding a right ventricular assist device can provide a more favorable arteriovenous pressure gradient across the kidney. However, outcomes of patients who require biventricular devices are poor (11). There are no approved permanent right ventricular assist devices in the United States. Few centers have experience in bilateral device placements, but it is not common practice in the United States and outside the scope of this review. Patients who develop AKI after LVAD have a survival disadvantage, particularly if RRT is required (12). Patients who require dialysis are less likely to go on to transplantation compared with those without AKI (52% versus 84%) (9). Genovese et al. (13) found that AKI was the only early major adverse event associated with 1-year mortality post-implantation. Postoperative AKI is associated with a higher incidence of postoperative right ventricular failure, ventricular arrhythmias (9), infections, and liver injury (14). Brisco et al. (14) observed that large early gains in GFR are associated with subsequent declines to near baseline levels. It is possible that patients with extreme cardiomyopathy see the greatest benefit to change in kidney perfusion with improved cardiac output. These patients have an improvement in their GFR but have a high overall mortality associated with the severity of their underlying disease (13). Changes in kidney function after LVAD implantation have been explored in multiple studies with conflicting results (15,16). For most patients, LVAD support optimizes circulation and improves kidney function (17). Recovery of kidney function after LVAD implantation has been investigated in different cohorts (15–17), including in patients with CKD (16). For most patients with end-stage CHF being considered for LVAD implantation, kidney injury was reversible and likely related to poor kidney perfusion. Hasin et al. (4), with preimplant eGFR <60 cc/min, showed an improvement to >60 cc/min after the first month. Brisco et al. (14) reported a median improvement in GFR of around 50% by 1 month, and eGFR doubled in 17% of patients. In some studies, no improvement in kidney function was observed after 1 month (14,16). This may be due to the patient’s underlying intrinsic kidney disease, diabetes, hypertension, renovascular disease, or ongoing volume overload or low output due to CHF despite LVAD implantation. Hasin et al. (4) showed that younger age, GFR improvement with optimal medical therapy, IABP use, kidney size >10 cm, no treatment with angiotensin-converting enzyme inhibitors or angiotensin receptor blockers, higher bilirubin, higher Lietz–Miller score (a risk score in HeartMate XVE patients ineligible for heart transplant and not validated in current LVADs), and atrial fibrillation were univariate preimplant predictors for improvement in kidney function at 1 month. Multivariate analysis showed improved GFR with optimal medical therapy and IABP as independent predictors of postoperative improvement in kidney function. In our opinion, patients with cardiorenal syndrome type 2 are more likely to have improved GFR than patients with underlying primary kidney disease. Even when kidney function improves at 30 days, there can be a subsequent decline. In approximately 3000 patients, Brisco et al. (14) showed that median preimplant GFR was 61 ml/min per 1.73 m2, and improved to 80 ml/min per 1.73 m2 at 1 month. At 1-year postimplantation, the median improvement in GFR was 2.6 ml/min per 1.73 m2 over the preimplant level. This pattern of improvement and then decline was consistent, regardless of device strategy or severity of illness (14). Three likely mechanisms for late kidney impairment are postulated: (1) chronic hemolysis, (2) diminished pulsatility resulting from continuous flow, and (3) progressive right ventricular failure (Figure 2). Hemolysis is seen with continuous flow LVADs and is thought to result from shear stress as blood travels through the pump (3). This leads to red blood cell breakdown and release of free hemoglobin. In the presence of pump thrombosis, laminar flow is disrupted, platelet aggregation and deposition occur, and shear forces increase. Pigment nephropathy from hemolysis is documented (18), and patients present with hemoglobinuria and AKI. In one case report, a kidney biopsy of a patient post-LVAD implantation demonstrated subclinical iron/hemosiderin deposition in tubular cells (18). Many factors contribute to early and late AKI after LVAD. Postulated mechanisms of immediate AKI and late stage AKI. ATN, acute tubular necrosis; CHF, congestive heart failure. Right ventricular failure can develop at any time during LVAD support and has several etiologies. The Interagency Registry for Mechanically Assisted Circulatory Support (INTERMACS) defines right-sided heart failure as an elevated central venous pressure and findings of one of the following: peripheral edema, ascites, hepatomegaly, worsening hepatic function (total bilirubin >2.0), or renal dysfunction (serum creatinine >2.0) (19). A measured central venous pressure >16 mm Hg, findings of a dilated inferior vena cava with absence of inspiratory variation by echocardiography, or clinical findings of jugular venous distention at least halfway up the neck in an upright patient suggest clinical signs of right-sided heart failure. Furthermore, the need for prolonged inotropes, inhaled vasodilators, or right ventricular assist device support post-LVAD implantation indicates the severity of right ventricular dysfunction. Normalizing left ventricular cardiac output post-LVAD implantation leads to increased blood return to an impaired right ventricle, which can worsen right-sided heart failure and lead to AKI from renal venous hypertension (20–22). Alternatively, too little flow through the LVAD leads to high right ventricular afterload, which can also lead to right-sided heart failure. Recognizing the effect of right-sided heart function on the kidney is important, and efforts to maximize hemodynamics post-LVAD implantation can help prevent decline in kidney function. We recommend aggressive diuresis and ultrafiltration as needed when right ventricular failure is suspected in the setting of AKI. Lack of pulsatile flow in the kidney is an active area of research. The nonpulsatile nature of continuous flow LVADs may contribute to kidney function decline. Animal models have shown that prolonged continuous flow causes changes in the aortic wall, including medial degeneration, smooth muscle cell depletion, and medial fibrosis (23,24). This leads to decreased peripheral vascular reactivity and stiff, poorly compliant vessels (25,26). Animal studies of continuous flow in the kidney found proliferation of smooth muscle cells in the afferent arterioles in the renal cortex and severe periarteritis (26). Periarteritis leads to upregulation of the local renin-angiotensin aldosterone system (RAAS) in the kidney (26). Although this mechanism has not been demonstrated in humans, this may partially explain the late decline in GFR in patients post-LVAD implantation. It will be interesting to review the HeartMate 3 experience, given the asynchronous pulsatile design achieved by programmed speed changes, and to assess its effect on kidney function. Interestingly, analysis of the INTERMACS data reveals that gradual late decline in GFR was observed with both continuous and pulsatile flow LVADs, hinting that pulsatility cannot be the sole mechanism of kidney injury (14). In summary, late decline in GFR is likely multifactorial and may be related to (1) hemolysis, (2) right ventricular failure, and/or (3) lack of pulsatile flow. Cardiorenal syndrome is classified into five variants (27,28) (Table 3). Type 2 cardiorenal syndrome is of particular interest in patients with an LVAD. In these patients, high renal venous pressures and inflammation cause progression of CKD (27). CHF leads to increases in renal venous congestion and high intratubular pressure, which decreases filtration fraction and GFR (29,30). Other pathologic factors in type 2 cardiorenal syndrome include activation of systemic RAAS and sympathetic activation, leading to upregulation of the local kidney RAAS (31). LVAD implantation reverses some of these mechanisms. Most of the immediate kidney function improvement noted with implantation of LVADs is likely a result of decreased renal venous congestion (27). In addition, improvement in cardiac output and renal arterial blood flow often helps recovery of the AKI. But there is evidence that there is also a reduction of sympathetic tone and downregulation of RAAS after LVAD placement (32–34). James et al. (35) found that in patients being bridged to transplant, plasma renin activity and plasma aldosterone levels decreased significantly from baseline after implantation of LVAD. Post-transplantation, after more than 45 days on LVAD support, both plasma renin activity and angiotensin II levels decrease (34). This suggests that the RAAS activation in CHF is meaningfully reduced after LVAD implantation or heart transplantation, providing biochemical confirmation of the improvement in hemodynamic status (32). In summary, the LVAD experience has shed light on the cardiorenal syndrome and has underscored the importance of RAAS and renal venous hypertension. A minority of patients with AKI after LVAD will require dialysis. The incidence of needing RRT ranges from 11% to 33% (36). In the initial phase of AKI, most patients are on continuous RRT. Some patients will stabilize and be transitioned to intermittent RRT. For nephrologists, there are three major questions that need to be answered. First, Is Hemodialysis Safe in Patients with an LVAD? Quader et al. (37) reviewed ten patients that required hemodialysis (HD) on LVAD support. A total of 281 HD sessions were administered for 1025 hours. Only 5.3% of sessions were interrupted, and only two of these were for low flow LVAD alarms. No serious adverse events were noted in these patients. Second, Can Arteriovenous Fistulas Mature without Pulsatile Flow? No trials have evaluated the patency of arteriovenous fistulas (AVFs) in patients with an LVAD. Prior recommendations from experts have advocated for arteriovenous grafts as the first option (38). However, new evidence suggests that successful HD via AVF is possible. Three publications described eight cases where AVF maturation proceeded normally. There were no hemodynamic or infectious complications reported (39–41). Two patients required secondary intervention, but eventually the AVFs functioned well (41). In our opinion, AVFs can be used successfully in patients with continuous flow LVADs. AVF should be considered as the first choice, given the infection risk associated with arteriovenous grafts. Third, What Modality Is Preferred: HD or Peritoneal Dialysis? HD is the default option, but peritoneal dialysis (PD) should be given strong consideration because of the slow continuous nature of ultrafiltration. PD is a viable option in the newer continuous flow LVADs as they are placed in the preperitoneal position (6). Before PD catheter insertion, it is important to evaluate the course of the driveline as it can sometimes pass through the peritoneum. A concern with patients with an LVAD is infection of the driveline exit site, so the PD catheter should be placed far away from this area. In addition, PD peritonitis is still less common compared with HD catheter-related infections leading to bacteremia. Overall, PD offers three benefits over HD: (1) continuous ultrafiltration, (2) low risk of systemic infection from bacteremia, and (3) ease of home modality. Results with PD in patients with an LVAD are encouraging (42,43), but because of lack of any randomized, controlled trials and comfort level of both cardiologist and nephrologists, the superiority of PD cannot be claimed. Educating dialysis nurses is paramount. Nurses must be capable of responding to LVAD alarms and communicating with the LVAD team. Three numbers are important to know: pump speed, pump flow rate, and the pulsatility index in HeartMate II (38,44). The pump speed is the rate of revolution of the rotor. Pump flow is derived from the pump speed and power, and is inversely related to the pressure differential across the pump. The pulsatility index is a dimensionless figure that is derived from the LVAD pump (45). Despite the presence of an LVAD, the native ventricle can have residual pulsatile activity that transiently increases flow within the LVAD resulting in a flow pulse. When the ventricle has native contractile function, then the resulting flow pulses will cause the pulsatility index to increase. When preload decreases, the contractility of the left ventricle and the pulsatility index decrease. A low pulsatility index alarm can indicate excessive ultrafiltration. BP is challenging to monitor during dialysis in a patient with a continuous flow LVAD as many patients often have no pulse (46). Residual left ventricular function can yield some pulse pressure and a sphygmomanometer may be tried in these patients (53%) (46). Doppler audible ultrasound with calibrated BP measurement devices are used in most centers to get an MAP reading. MAP can be measured by placing the Doppler probe over the brachial artery and inflating the cuff using the nonaccess arm. Continuous flow LVAD devices are sensitive to elevated afterload. Increased afterload can reduce pump output and/or cause retrograde flow through the LVAD because of the absence of valves in the device. As a result, it is important to monitor for elevated BP and treat accordingly. The MAP that is optimal is between 70 and 80 mm Hg, and must not be allowed to exceed 90 mm Hg. When initiating antihypertensive therapy, negative inotropes should be used with caution and in collaboration with the LVAD treatment team. The antihypertensive agents of choice in this population are angiotensin-converting enzyme inhibitors or angiotensin receptor blockers. In patients with AKI and CKD, hydralazine provides adequate control. Table 4 summarizes the challenges faced by the dialysis team with a patient with an LVAD. LVAD implantation improves hemodynamics via restoration of blood flow and decreases in ventricular filling pressures. The effect of LVAD support on kidney function is complex. As knowledge of LVADs and kidney disease grows, some of our opinion-based recommendations (Table 5) may change with time. Major impairment of kidney function preoperatively is a risk factor for AKI. 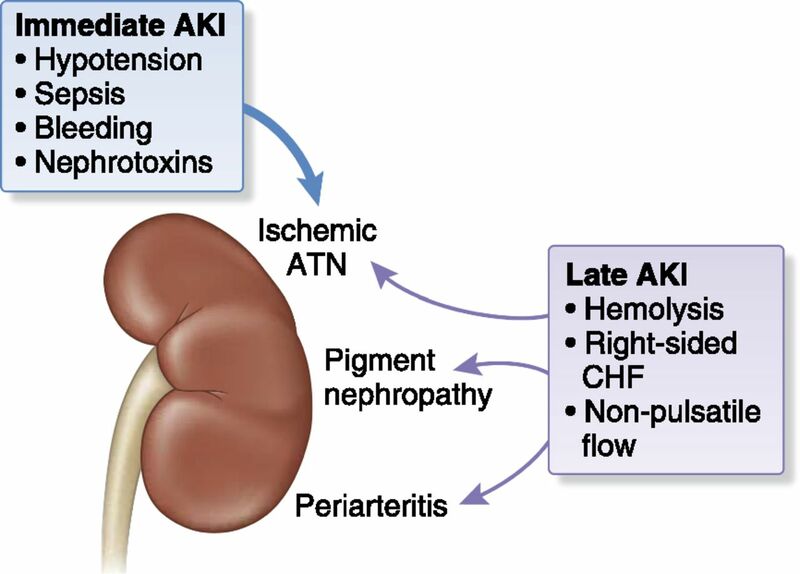 Because AKI postimplantation confers a high mortality, preimplant kidney dysfunction should be strongly considered in discussions regarding candidacy. Known risk factors such as age, right ventricular dysfunction, malnutrition, and intraoperative blood loss importantly affect outcomes with this lifesaving device. Careful assessment of risk factors and early involvement of a nephrologist in the LVAD planning team may help improve outcomes. The advent of continuous flow LVADs has taught us the various factors involved in type 2 cardiorenal syndrome and can help further assist in management. LVAD patients on dialysis require expert communication between the LVAD and dialysis teams. Further studies are needed to aid in identifying patients with CKD who are most likely to benefit from LVADs. We would like to thank our medical librarian, Ms. Janice Lester at Northwell Health, in the search strategy utilized in obtaining articles related to our review topic.